This page is devoted to all of my favorite bands as well as my family. I have pictures of my favorite bands, and pictures of me and my family, and even pictures of me and my family with my favorite bands. 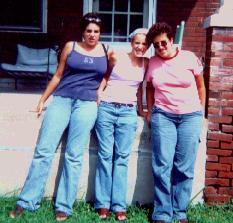 This is a picture of (from left to right) me, my sister Alex, and my sister Logan. Click on the links at the top of my page to go to other sections of my site.